Diversions of the Groovy Kind: The Diversions Turns 10 "Best of" Birthday Bash! Mighty Marvel Rocks the Groovy Age! The Diversions Turns 10 "Best of" Birthday Bash! Mighty Marvel Rocks the Groovy Age! Happy anniversary, Groove-ophiles! This coming Saturday Marks 10 years since the Diversions hit the interwebs, so Ol' Groove thought we'd celebrate by looking back at some his favorite, but least viewed, posts from our first fateful year! We'll be back new and live next Monday with a special anniversary post. Until then, enjoy these "reprints" and rap with us about 'em! Ol' Groove was 13 years old and just getting into rock (as opposed to Top 40/Pop). If you were 13 in 1977, chances are your favorite rock group was KISS. If you were a KISS fan and a comicbook fan, 77 was a great year! Being a member of F.O.O.M., I knew about the coming of a KISS comic (actually Marvel Comics Super-Special #1) months before my buddies. Good thing, too, 'cause when I found a copy at a local convenient store, it was the only copy on the rack! 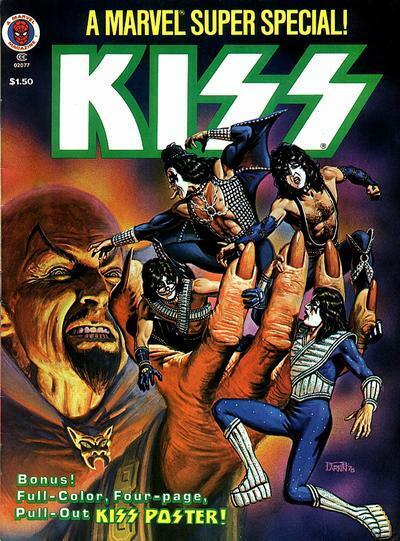 I snatched it up, plunked down a week-and-a-half's allowance and was blown away by the insanity that KISS, writer Steve Gerber, and artists Alan Weiss, John Buscema, Rich Buckler, Sal Buscema, and Al Milgrom cooked up. The first thing that struck me is that this was an event, not just your average comicbook. It was magazine sized, in full color, and was twice the number of pages of a regular comicbook. About half the book was devoted to KISS' superheroic exploits (more on that below), the rest of the book was like a fan/rock magazine devoted to the real KISS, complete with group history, discography, and loads of pics. Oh, and it was printed using the band's actual blood. (Honest!) It's been reported that the first KISS comic was Marvel's best-selling comic, and held that title until 1990s Spider-Man #1 by Todd McFarlane. Let's just say it was a hit with Teen Groove, too! After all, the boys gained cool powers and fought Dr. Doom and Mephisto--two of Marvel's greatest villains. What's not to love? I read it til it fell apart (and looking at what it goes for in the back issue market, it makes me kinda sad!). If you'd like to read a good summary of the story, it's right here, along with a summary of the second KISS comic, Marvel Comics Super-Special #5. 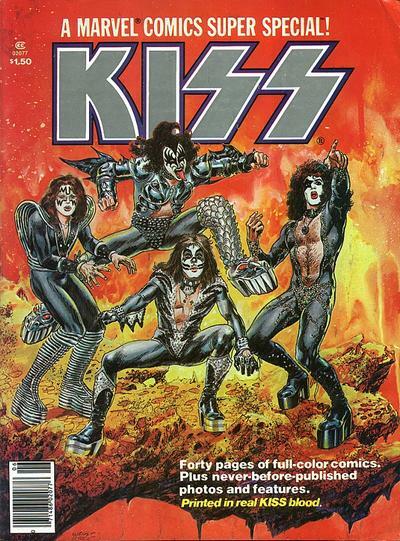 Now, the second KISS comic didn't have near the cool factor as the first one (even the Creem style articles were gone), but it was a good comic. Nobody does weird like Steve Gerber, so writer Ralph Macchio (no, not the actor) went for more of a fantasy bent, with bits of humor. The mage had a great poster--and even better cover! A few months before the second KISS comic, Marvel released Marvel Comics Super-Special #4 which featured the comicbook biography of the Beatles. 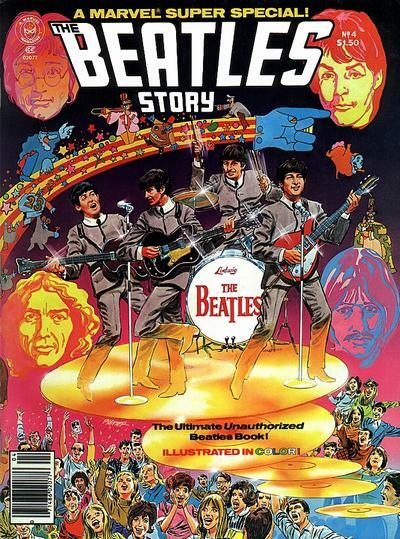 Now this mag was in the same style as the first KISS mag, but instead of making up a story with the Beatles as superheroes, Writer David Kraft and artists George Perez and Klaus Janson set out to present the whole history of the Beatles in comicbook form. It was an original and intriguing idea for a comic, and Teen Groove surely enjoyed and appreciated it. The creators obviously put their whole hearts into the project, and it was also obvious that they loved the Beatles. Made for one of the most heartfelt and bittersweet comics I've ever read. The next rock n roll Marvel Teen Groove got his hands on was none other than Marvel Premiere #50, featuring the one and only (thank goodness!) Alice Cooper! Now, this was a standard comic in size and dimensions--but the story and art were definitely out there (and in a good way). "From the Inside" was a side-splittingly hilarious adaptation of AC's then recently released album of the same name. 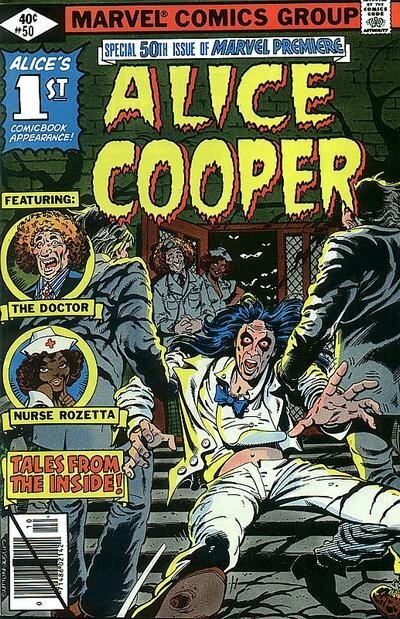 Written by Alice Cooper (himself! ), Jim Salicrup, Roger Stern, and Ed Hannigan, with pencils by the criminally underrated Tom Sutton and inks by the legendary Terry Austin, this comic was unlike anything Ol' Groove has seen before or since. Captured and placed in an insane asylum, AC has to learn to adapt or escape--and meets up with folks way crazier than himself in the process. The story was done as an homage to the old EC horror comics, right down to the lettering style, by way of EC's own Mad (the comics version, not the magazine). Hard to believe, but it's even better than the first KISS comic! Now, if you've got the time/money/inclination to track these magnificent mags down, have a blast! ROCK ON! I was a massive KISS fan (Still am) those 2 magazines were gold to me, wish I still had them. Like you I read them til they fell apart. 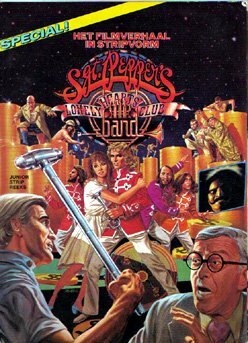 I loved the Beatles' Super Special. Great Perez/Janson artwork. I gave away my copy as a gift to my father and replacing it now is a bit prohibitive. The Overstreet Price Guide comes out this week. Can't wait to buy it and see what my bagged and boarded collection is worth (at least on paper). Happy Anniversary Week! I was 13 in 1977 and remember getting my hands on a copy on a trip to downtown Cleve-town at Cosmic Comics (Howard's Hometown, dontcha know?). Good times! Alas, my copy was lost to basement flood waters decades later...any chance Ole Groove is planning on posting the insides of that fabulous first KISS issue? Here's hoping to 10 more groovy years...and beyond. Congrats Groovster! WOW! Has it been years already? Not sure when exactly I stumbled upon this rockin site of yours. Thank you for all your hard work & time you've put into this excellent website. I can't wait to be here Monday! Keep on Groovin! How about some more Nova, What If & GODZZIILLAA!! Love to review these too. I remember picking up Marvel Premiere #50 off the spinner racks and i still have it. Great ish with superb art (as you rightly stated) by the under-rated Tom Sutton! Let me add my congratulations and gratitude for this wonderful site! An early issue of Ghost Rider (that I still have somewhere....) featured a villain who commanded rattle snakes. The artist obviously used Alice Cooper as a model. One close-up looked exactly like a photo of Alice that had been in most of the music magazines of the time. I wrote a letter to the letters page asking if Alice had been the inspiration (hoping for a No-Prize). A week or so later, I got a postcard alerting me my letter was going to be published and what issue it would be in!!! Yeah, except when it goes on sale a month or so later, I rush to Dave's Candy Store (in the Bronx) where I bought all my comics, run home and open the letters page.......only to find a snide put-down, saying (I quote from memory): "No we wouldn't do that. We don't it's good idea to mix comics and music- What's next? The Beach Boys in Silver Surfer? We think it's got as Frank Zappa says,'No Commercial Potential'"
I know they had to deny it because of image rights, but in that case they could have just not published my letter, not use it as an opportunity to take a nasty shot at a kid. As you can see, it still rankles, but what really pissed me off, was a year or so later, the scumbags are making a load of money off the "Commercial Potential" of selling a KISS comic who's sales gimmick is that the members of KISS supposedly donated a pint of blood to be mixed in with the ink! I forgot to add earlier. I hope we see your still posting in 2038. This era was my Golden Age of comics! OK maybe like 1966 onward to 1980. Congrats! Thanks for years of fun! I've seen things on here I wouldn't have seen elsewhere. Long may you wave! And don't forget about comics that became part of the album art in the groovy era: Neal Adams did a comic story for the Mighty Groundhogs album in 1971 or 2, & Dave Gibbons (prw-Watchmen) drew a comics story inside Jethro Tull's "Too Old to Rock 'n Roll" album in 1976.